In order to keep carpets clean in the home, it is important to routinely maintain them. 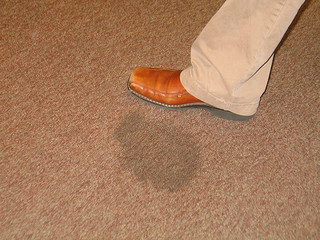 If you have the privilege of getting new carpets, it is worth the effort to spray them with a commercial stain blocker. This will prevent stains from penetrating the fibers and make cleaning much easier, prolonging the life of your carpet. In addition, it is important to vacuum carpets weekly to remove dirt before it works itself down into the pad. In addition to everyday wear and tear, pet stains and stains from spills are the most common areas of concern among carpet owners. Regardless of the type of spill, it is important to address it immediately. The longer the stain sits, the more difficult it will be to remove. First you should blot the stain with a clean towel or cloth. Rubbing the stain will only spread it to other areas on the carpet. While each individual stain can be addressed in different ways, a general rule of thumb is to use baking soda and club soda. In many situations, a mixture of baking soda and club soda will lift part or all of the stain, as well as neutralizing odor. For pet stains, since odor is the main concern, the following procedure should be followed. Blot up as much urine as possible. Liberally cover the stain with baking soda. Cover the stained area and baking soda with some kind of plastic sheeting such as a plastic bag. Apply something heavy, like a stack of books, on top of the plastic in order apply additional pressure to the carpet. After 24 hours, remove the plastic and vacuum up the baking soda. While there are countless home remedies for carpet stains, the best option is hire a professional carpet cleaning company. A professional will have powerful vacuums and chemicals that will be able to lift older stains and restore carpets. In addition, the job will be done quickly. Contact us today at (412) 573-9291. Previous Previous post: What are the most difficult carpet stains to clean?